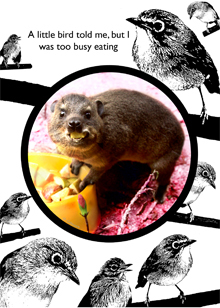 Grease: A rescued young Dassie (aka Rock Hyrax) at home in South Africa. The background features a trio of rescued white eyes, a small green bird. "A little bird told me, but I was too busy eating"